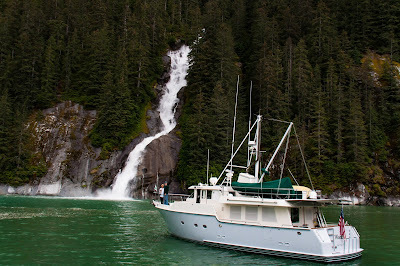 Traveling to this stunning location included Stephens Passage as we left Petersburg Alaska. We only stayed one night in this hardy fishing town. 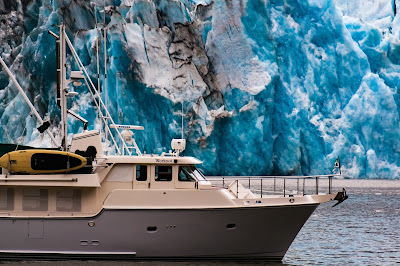 Known as the Halibut capital of Alaska we found the docks and the small town friendly. Landing at Petersburg was a flashback to a tough landing at La Paz Mexico over a year ago where the current swept WORKNOT to the dock broadside. This time experience won out and on the second attempt made a fairly good landing in 3-4 kts of cross current. The harbor actually had an eddy current going opposite of the arrival current. No battle scars this time. Petersburg is very proud of its Norwegian heritage and the Sons of Norway museum was having some type of show when we arrived. A school bus load of folks a little older than us were greeted by young girls in full costume as they arrived. Sorry, we did not have a phone or camera available to get more pictures. I can just imagine Sig from “Deadliest Catch” strolling the streets of Petersburg. The current was on our side as we headed north giving us about 1-2 kts of push almost the entire way to Hoolkham Bay. Our original plan was to make this trip in two nights but the added speed got us into Tracy Arm Cove just before dinner. Rain and fog were with us all day but never totally blocking visibility or slowing our pace. Entering Holkham Bay requires crossing a bar that shallows from over 300' to just over 40’. The opening is 1.75 miles wide but navigable at a width of only 0.3 miles. The channel is marked by two buoys with a note indicating one of them is often carried off its location by icebergs. 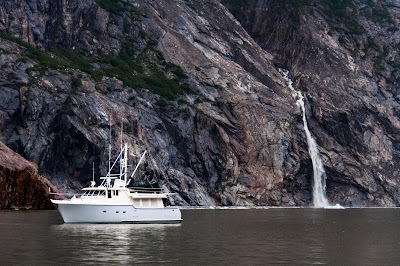 We anchored in Tracy Arm Cove with several other boats, one asked us to move after we had set our anchor-announcing he was 100 ft long and needed more room, and settled in for a quiet evening as the rain had ended and the air was very calm. About midnight winds picked up and by 1 AM wind was blowing 20-30 kts in sharp gusts. 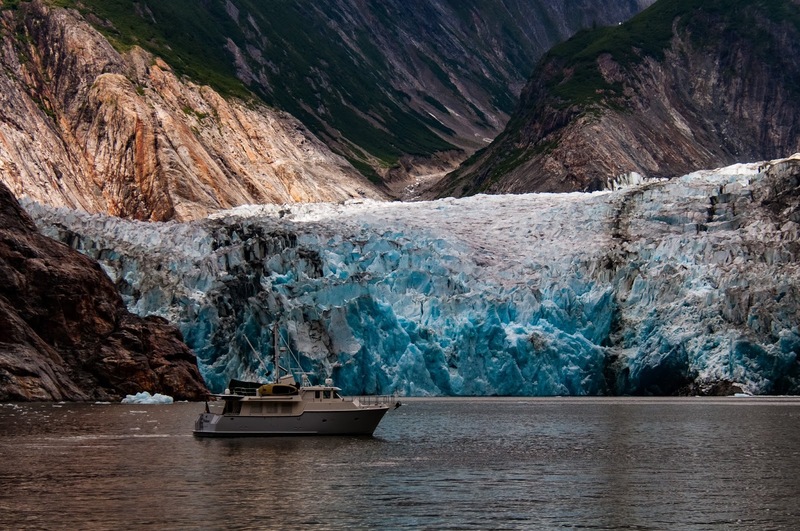 This is known as a Williwaw wind and it is caused by cold air rushing down the face of the glacier and mountains. Localized but strong they can reach over 50 kts in some areas. Added about 75 ft of scope to our anchor and slept in the pilot house to be ready if we moved. By 3 AM winds had calmed down and WORKNOT was still firmly attached to the bottom by our dependable Rocna anchor. (If you want to start a dock argument; just ask any boater which is the best anchor). 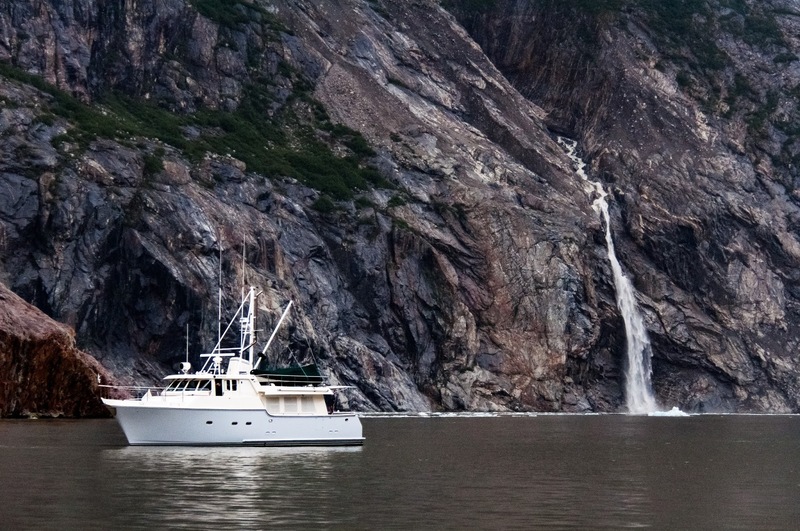 A few of our neighbors at Tracy Arm Cove. 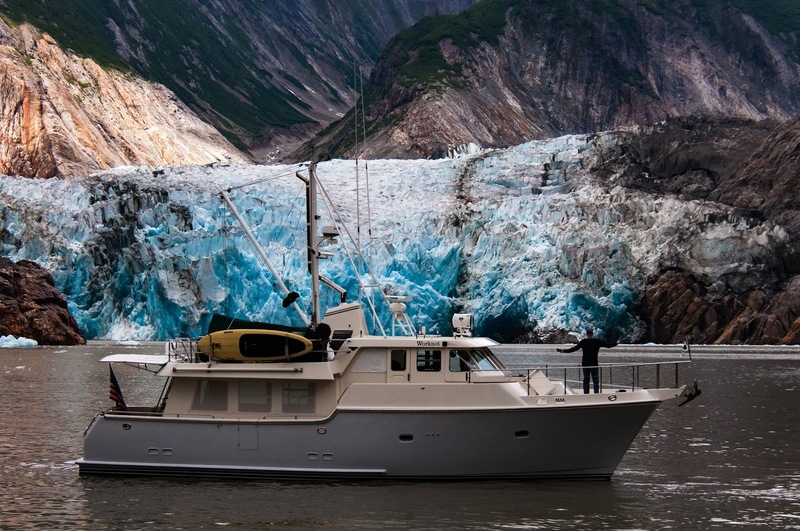 Our friends on Antipodes led the way during the 22 mile trip up Tracy Arm to see the glacier. 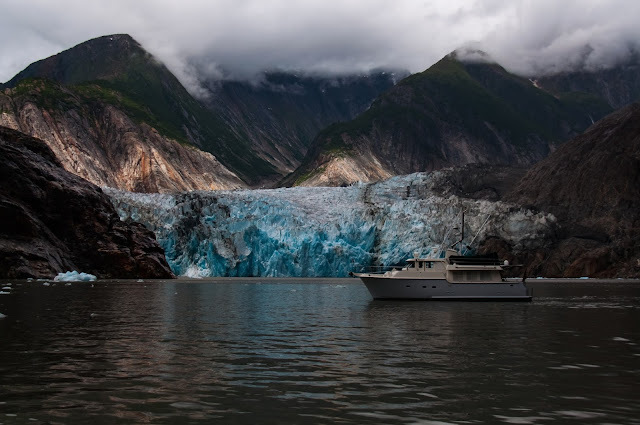 We saw some ice early on but things were fairly clear until we got about 4 miles from the split where Tracy Arm branches into the North and South arms leading to the face of the Sawyer Glacier. 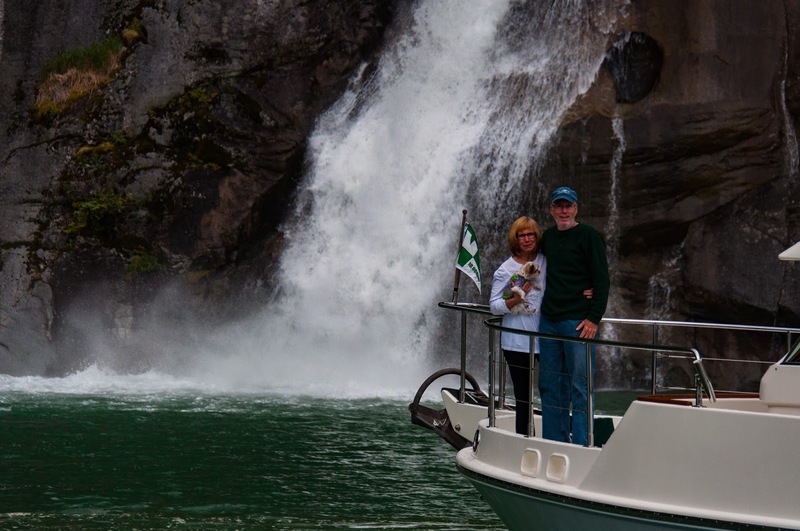 Along the way stunning water falls on both sides of the fjord provide enough water that the normal current flow is always and ebb. Fog and mist hung low in the air but our trip was not hampered by the low ceiling. Running in the ice flow with heavy fog would not be possible and we kept a close watch behind us to be sure we did not get closed in. Several tour boats from Juneau raced ahead of us to the face of the glacier. Following Antipodes (Steel Hull) took plenty of effort and several times had to push “bergy bits” off the bow to make a path. Even the small pieces of ice made a terrible sound against the hull. The color and shape of the bergs was mesmerizing. Blue tones and exotic shapes drew your attention from piloting the boat to staring at them in wonderment. Finally we made our way to the face of the glacier. Caught a calving of pieces about the size of the boat but too slow with the camera. As you can see we had a very spectacular day. A few more pictures to better express what we got to see.